Custom Stock Status will help admin install additional stock statuses for the products. Information about the product’s stock status is displayed at the frontend more accurately and clearly, giving customers better shopping experience and increasing the ability to buy from them. In particular, admins can custom stock status automatically or manually with image and text to quickly attract customers’ attention with appealing status. That’s the feature of Mageplaza Custom Stock Status extension. 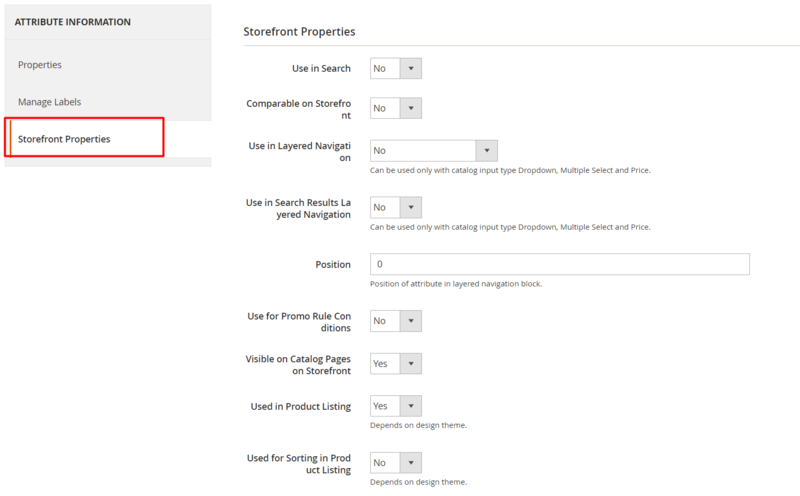 Login to the Admin Magento, choose Stores> Custom Stock Status> Configuration. Instock: only instock products will be applied Custom Stock Status. Out of stock: only out of stock products are applied Custom Stock Status. Both: apply custom stock status to all products. Mageplaza One Step Checkout: This option only displays Custom Stock Status when you install the Mageplaza’s One Step Checkout extension. With this extension integration, you can summarize 6 payment steps in just one page to make it easier for customers to shorten the payment process. Selecting Yes to display the Custom Stock Status on options such as size, color, … with the Configurable Product and the sub-products of Group Product, Bundle Product. Selecting No will not display the Custom Stock Status at any child product type. Select Yes, it will enable Automatic Stock Status based on Dynamic Quantity Ranges. If the product satisfies Dynamic Group, it will apply Stock Status with Group Name group. Dynamic Group applies only to Simple Group. If No is selected, it will not apply Dynamic Groups. In case both the Custom Stock Status and Dynamic Groups are selected and enable, it will prioritize the information in the previous Dynamic Groups field. You can access Store> Attributes> Product to search with 2 attributes to create additional options for Custom Stock Status and Dynamic Groups. Login to the Magento Admin, choose Stores > Custom Stock Status > Manage Custom Stock Status. Or you can access to Store > Attributes > Product, find mp_stock_status at Attributes Code. 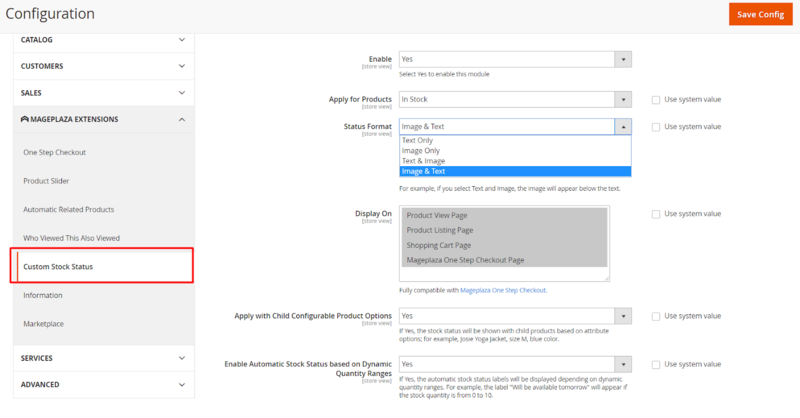 In this section, you can create the option Custom Stock Status attribute when accessing Catalog> Product, edit a product. You can change the name for attributes, the names of these attributes will be displayed in the Catalog> Product section, edit a product. 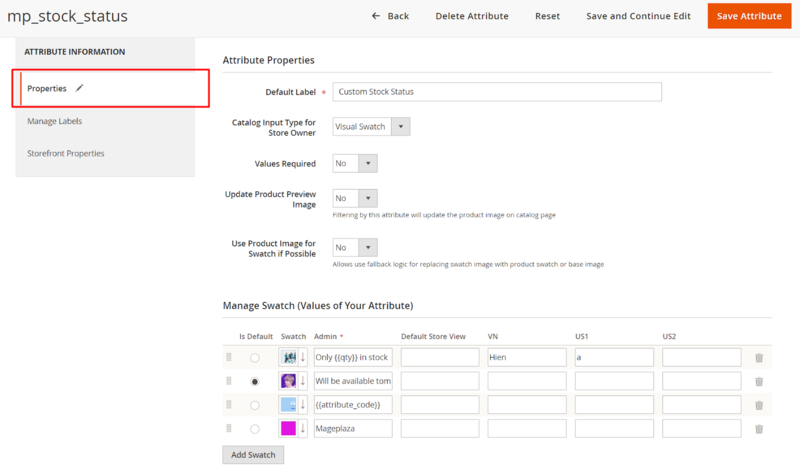 Note: If you select the Visual Swatch, you can display both the label and image outside the Frontend for Custom Stock Status, depending on the selection of the Status format field at Configuration. With Admin is the value you must enter and for each store you can replace the option name of attributes. If the names of the stores are left blank, they will default using Admin values. Values Required: Select Yes means that this attributes will be required to select option. This section you can configure the display position of attributes. 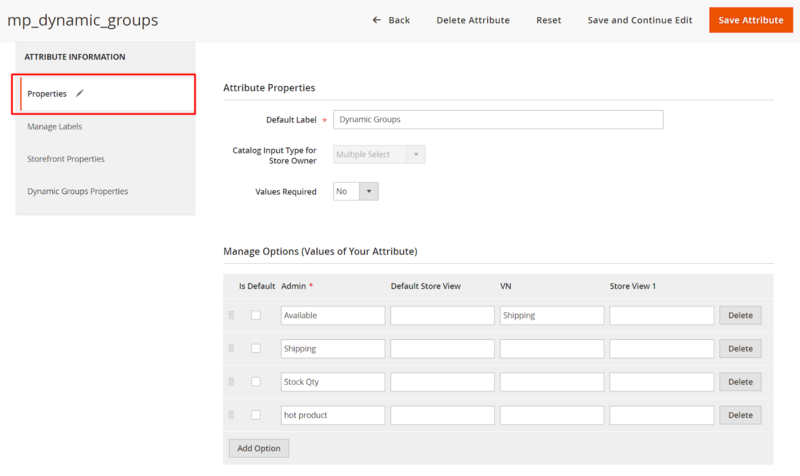 The Attribute Code and the Validation Input for Store Owner field is the default value. Select Storefront Properties information to display Attributes in the storeviews you want. 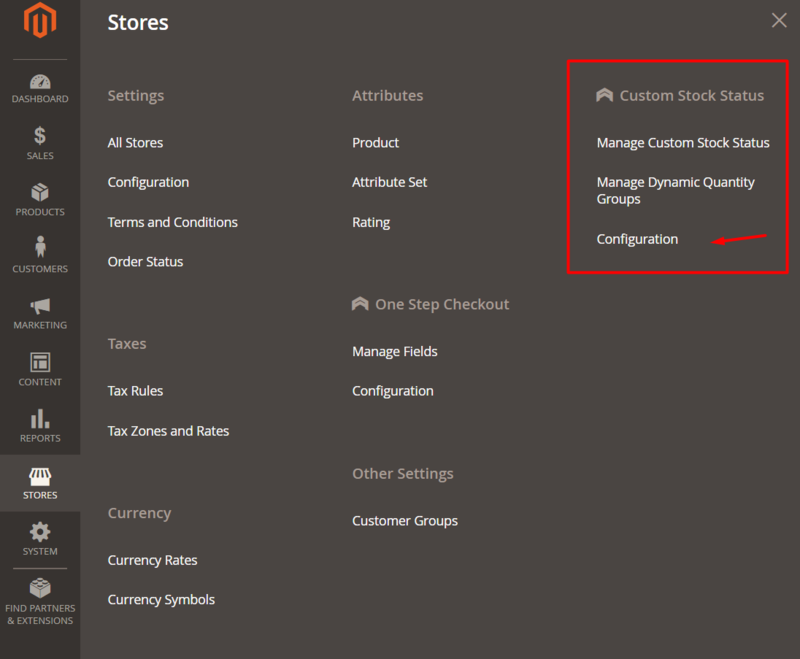 Login to the Magento Admin, choose Stores> Custom Stock Status> Manage Dynamic Quantity Groups. Or you can visit Store> Attributes> Product, search in Attributes Code field with mp_dynamic_groups. For Dynamic Group, it only applies to Simple Product and if the product satisfies Dynamic Group, it will give priority to consider or apply Dynamic Group first. 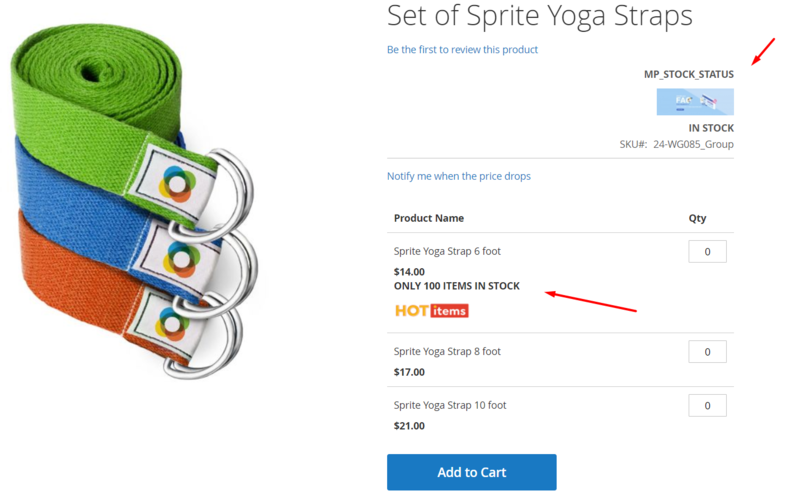 Catalog Input Type for Store Owner: In this field, the default input type is Multiple Select. Multiple Select: create a name for Dynamic Group in Manage Options (Values of Your Attribute). If Simple Product satisfies each Dynamic group, then it will apply Stock Status with Dynamic group selected. 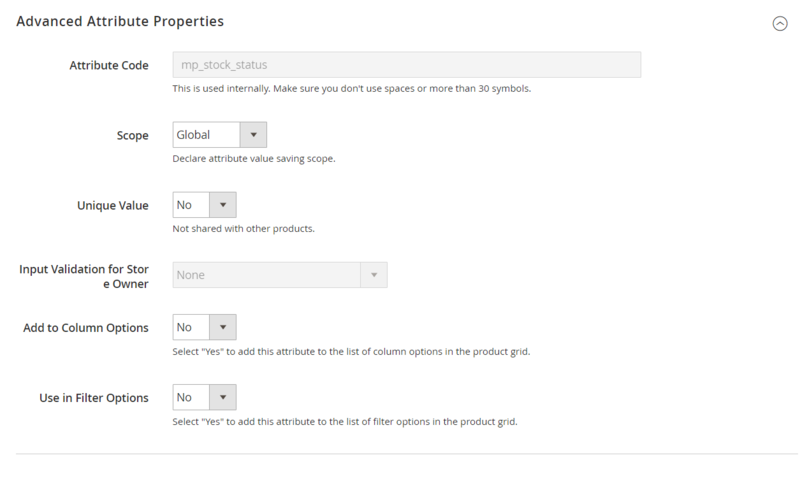 This section is similar to the Custom Stock Status section, you can configure the display position of attributes. With the Attribute Code and the Validation Input type for Store Owner field are both the default value. With Manage Labels and Storefront Properties is exactly the same as the ones above we have guided. For example, with Group Name is Available, select Stock Status as Coming Soon2(get Stock Status from the Custom Stock Status option you created above) with Quantity From = 0, Quantity To = 3. If the Simple product has quantity within this range will be applied Dynamic Group. Note: When your product has a satisfactory quantity to apply Dynamic Group, you must also consider that product meets the condition that you have configured at Configuration and you will apply Dynamic Group. If the product selects all Dynamic Groups then the priority will be considered from top to bottom. Login to the Magento Admin, choose Catalog> Products. Note: In case if both Custom Stock Status and Dynamic Groups to be selected, then priority will be given to Dynamic Group first. If the product is not satisfied Dynamic group, it will continue to consider applying Custom Stock Status. And if it continue to unsatisfy Custom Custom Status, the default Stock Status will be applied by Magento. 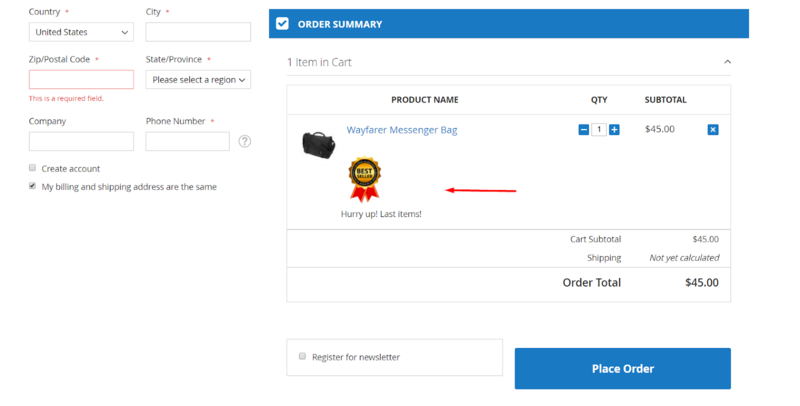 You can edit products for multiple products at the same time to save time. Go to Catalog> Products, on the product page select the products you want to edit the Custom Stock Status and select Actions> Update Attributes. If you delete the extension manually, you need to delete more the mp_dynamic_groups and mp_stock_status attributes in the database or in the backend. Product Slider: allows you to easily create many sliders such as featured products, bestselling products, new products, etc. 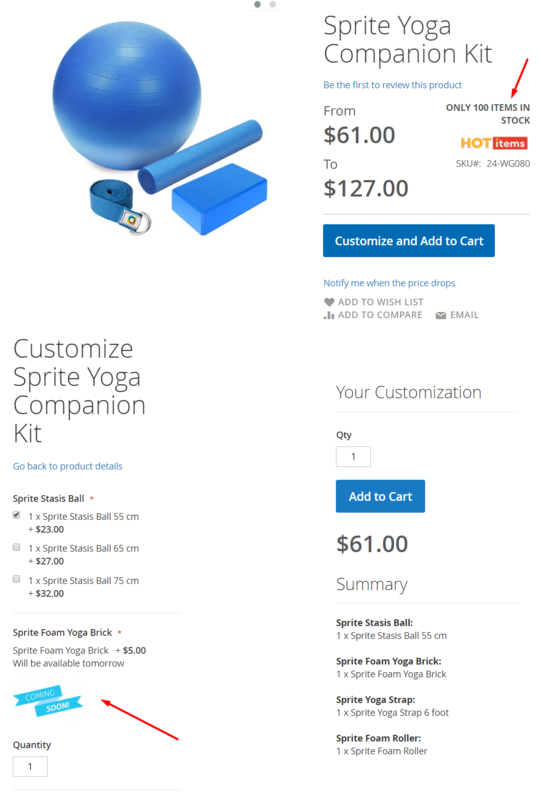 If you install Product Slider, products that apply Custom Stock Status on sliders with image or text or both. Automatic Related Products: with this extension you can design for related products displayed on slider and also show image and text of Custom Stock Status on that slider. Who Viewed This Also Viewed: Customers are more likely to make a purchase decision when they see a product that other customers have seen. By smart algorithms, the most viewed products will be automatically updated and proposed to customers.